Apple has already numerous different filters to apply parental control on iPhone and iPad devices. As we know, the iOS devices are not only popular among teenagers and well-settled people, but also among the kids. The usage of an iPhone or iPad without any parental control is a serious threat to kids future. With an iOS devices always connected with an active Internet connection makes everything smooth for the user, but it also raises many red flags. Therefore, we have many restrictions filters already in our iOS devices. All we have to manage them according to the usage of our youth. You can totally manage things, and block any adult website + content on your iOS device with few taps and passcode protected options. Apple has a filter dedicated for Safari browsing that blocks any kind of content on an iOS device, and force user to see something else than blocked content. Many schools and colleges have already implemented the parental controls on their device, but it is an essential for every other person who has brought an iOS device to his / her kid. The unsupervised use of the active internet connection can be limited to specific range of websites, or at least to those that you want. We are not talking here about hiding or blocking Safari application on iPhone or iPad device, but implementing few filters on the content that is going to make its way to your children. You can easily apply a filter in Safari with Web Restrictions using iOS default filter. The latest iOS has a built in feature that limits adult content and websites on your iOS device. Before moving forward to the tutorial, I want you to focus on the word “limit” – Apple didn’t used “stop” or any other word that confirms you about the 100% results, but it can assure you that your children is safe from many other harms. Step 1: Open “Settings” application, and head to “General” section. Step 2: Scroll down, and tap on “Restrictions”, and enter your secret passcode to protect these settings from being changed. Step 3: Scroll down to “Websites” and tap on it to edit Web Restrictions in Safari. Step 4: Now, you can see there are three options. All Websites, Limit Adult Content, and Specific Websites Only. The settings are now totally depends on what you want to do with internet browsing in Safari on your iPhone. Apple has designed its filter “Limit Adult Content” that only blocks the adult content and let your teen to browse anything than adult websites & content. The specific websites only section entirely blocks the Safari browsing to few websites. You can add specific websites that you want to allow your teen, and rest can be blocked. Personally, I am using the Apple’s designed “Limit Adult Content” filter as it is smart enough to protect young users from accessing adult content and as well as allows me to easily add any other website URL that I don’t want them to see. For example, I have blocked my own blog “geeksays.com” on iPhone. Now, whenever someone tries to open geeksays.com on my iPhone, the Safari browser will show this restriction message and asks him or her to browse something else. These restrictions can be easily taken off with entering the passcode, which you set up in the second step. Whenever, someone wanted to browse a restricted application. He / She have to tap on “Allow Website” in Safari browser, and enter the passcode. 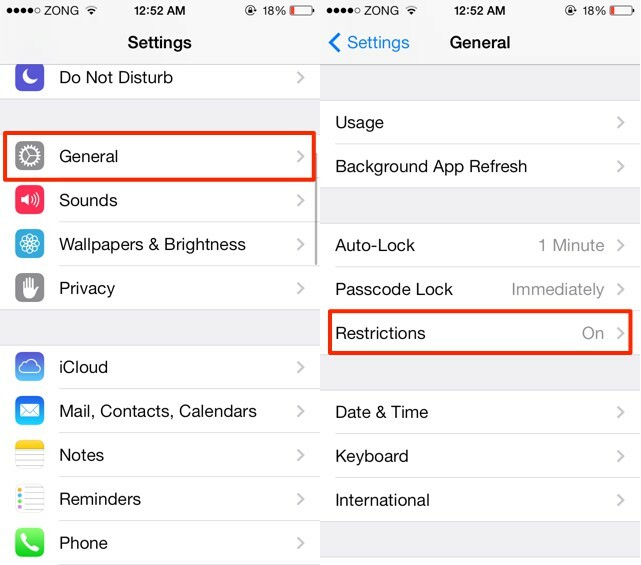 There are several other things on which you can impose restrictions in iOS. The earlier version of iOS required many steps to impose such limits on the usage of internet but with all-new iOS 7 UI update, Apple brings this Restriction section in front of everyone. that is really great stuff, i will use it.